From the road move upwards by slide-rocks to the abrupt wall (R0: 100 m, 30 0, в /к). On the section R4-R5 – in 5 meters to the right from the base of The Green corner go upwards to the chimney. Then go upwards along it , then upwards and little to the left to the tree (R4-R5: 40 m, 75 0, IV). On the section R5-R6 – firstly traverse to the inclined ledge, then go along the walls to the corner and move along it upwards and to the right (R5-R6: 45 m, 60 0, III). On the section R6-R7 – go upwards and to the right to the big tree, bypassing the overhanging wall (R6-R7: 40 m, 75 0, IV). On the section R7-R8 – go 40 m upwards and to the right till the beginning of the western buttress and along it to the grotto (hole) (R7-R8: 40 m, 70 0, III). 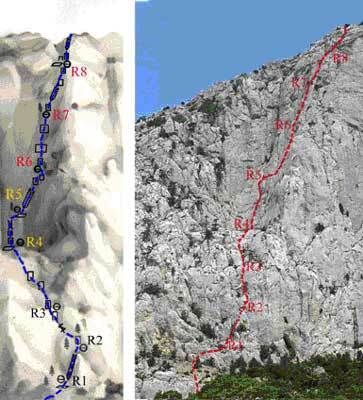 On the last section of the route firstly go upwards by the abrupt wall to the right of the grotto, then move along the corner to the plateau (R8-the summit: 40 m, 70 0, III). P.S. It is one of the longest and most difficult 4-grade routes in the region.